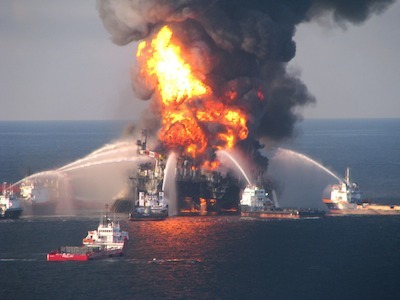 What Does the BP Gulf Spill Mean for Offshore Oil Exploration? EarthTalk: Does the Ongoing Oil Spill Disaster in the Gulf of Mexico Spell the End of Offshore Oil Exploration? The explosion of BP’s Deepwater Horizon drill rig on April 20 and the resultant oil spill now consuming coastal regions of the Gulf of Mexico could not have come at a worse time for President Obama, who only recently renewed a push to expand drilling off the coast of Virginia and other regions of the U.S. The debate over whether or not to tap offshore oil reserves with dangerous drilling equipment has been raging since extraction methods became feasible in the 1950s. It heated up in 2008 when George W. Bush convinced Congress to lift a 27-year-old moratorium on offshore drilling outside of the already developed western Gulf of Mexico and some areas off Alaska. Despite public protests, cash-strapped governments of several coastal states wanted the moratorium lifted given the potential for earning windfall revenues. Barack Obama had historically toed the Democratic party line on offshore drilling—don’t allow it—but changed his tune during his 2008 campaign to compromise with pro-drilling Republicans if they would play ball with him on his carbon emissions reduction and energy efficiency initiatives. Then on March 31, three weeks prior to the Deepwater Horizon explosion, which killed 11 workers and has caused untold environmental damage, Obama called for new offshore drilling in the Atlantic from Delaware to central Florida and in Alaska’s untapped northern waters. He also asked Congress to lift the ban on offshore drilling in the oil-rich eastern Gulf of Mexico, just 125 miles from Florida’s beaches. A key aspect of Obama’s new plan is to assess the potential risks and benefits of each specific offshore site before drilling there can commence. While Obama’s plan wouldn’t grant any new leases until 2012, the Deepwater Horizon problem is casting a long shadow over the public comment process now going on in Virginia and other coastal states otherwise ready to sign on the dotted line for exploratory wells to go into their offshore waters. Whether or not Congress and the American people are willing to let their government expand on what appears already to be some risky business is anybody’s guess at this point. Oil industry representatives maintain their equipment and processes are safer than ever. The U.S. Minerals and Management Service (MMS) blames the vast majority of the 1,400 offshore drilling accidents in U.S. waters between 2001 and 2007 on “human error,” not malfunctioning equipment, though some might argue that the distinction is irrelevant because there will always be human error. A small fire on the Deepwater Horizon in 2005 was found to be caused by human error, and most analysts agree some kind of bad judgment call also likely caused the rig’s ultimate demise. The MMS says it was already in the process of drafting new regulations that would require rig operators to develop programs focused on preventing human error, including operations audits once every three years for each rig. Some Congress members don’t think the new regulations are enough, especially in the wake of the BP tragedy. U.S. Senator Bill Nelson, a Florida Democrat who has led opposition to offshore drilling, has now called for a congressional investigation of safety practices at offshore oil rigs, and has asked the U.S. Interior Department to undertake a full review of all U.S. drilling accidents over at least the last decade.